An integrated circuit is also called as monolithic integrated circuit, chip, microchip, and IC can be defined as a set of electronic circuits with millions of resistors, capacitors, transistors, and other components are integrated on a semiconductor wafer or small plate of semiconductor material, generally silicon. Typically, every electrical and electronic gadget we use in our day-to-day life is an application of integrate circuits. Even though ICs consist of several billion transistors and other components but still they are smaller in size, very compact. With the advancement in IC technology the width of conducting line in an integrated circuit is reduced to tens of nanometers. There are different types of ICs; primarily ICs are classified into two types such as analog integrated circuits and digital integrated circuits. In this article as a special case we discuss about analog integrated circuits design and applications. Analog integrated circuits were primarily designed using hand calculations and process kit parts before the invention of microprocessors and other software dependent design tools. Analog integrated circuit design is used for designing operational amplifiers, linear regulators, oscillators, active filters, and phase locked loops. The semiconductor parameters such as power dissipation, gain, and resistance are more concerned in the designing of analog integrated circuit. Analog IC design process includes system design, circuit design, component design, circuit simulations, system simulations, integrated circuit layout design, interconnect, verification, fabrication, device debug, circuit debug, system debug. Digital IC design can be automated but analog integrated circuit design is very difficult, challenging, and cannot be automated. Primarily the ideas are implemented for designing block level design for the desired analog integrated circuit. Different blocks are designed and connected to obtain a complete block level system. Based on the block level system, different suitable components are used and connected such that to form a component level circuit. 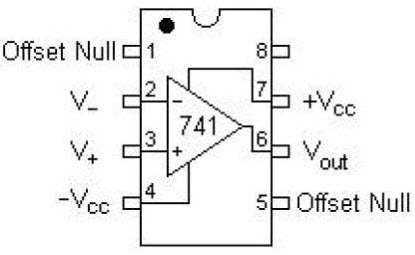 Using this circuit as the basic circuit for analog IC design, it is used for simulation. 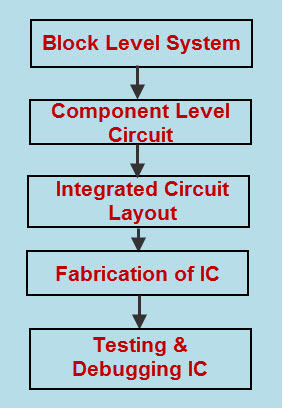 The component level circuit is used for verification. 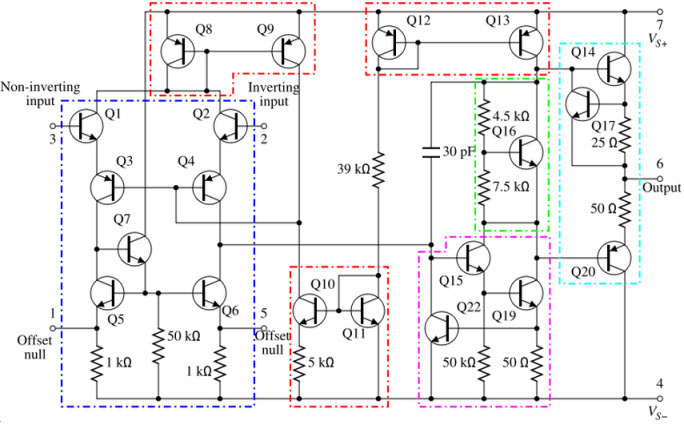 This circuit design is simulated and the based on the simulations results, the component level circuit of the analog integrated circuit is verified. After the verification of component level circuit of analog integrated circuit using simulations. Analog integrated circuit layout is designed using the physical translation. Thus, an analog integrated circuit layout is designed. Fabrication of analog integrated circuits involves several steps such as creating semiconductor wafer using semiconductor material (or directly semiconductor wafer can be used). Integrating different electrical and electronics components such as resistors, transistors, etc. on the wafer and packing the chip to form package IC. The analog integrated circuit is then tested and debugged for any checking the results with the estimated results. Then IC prototype is designed and used for characterizing the integrated circuit and evaluation board is used for evaluating the analog integrated circuit. The component-level circuit diagram of an analog integrated circuit design of IC 741 operational amplifier is shown in the figure below. 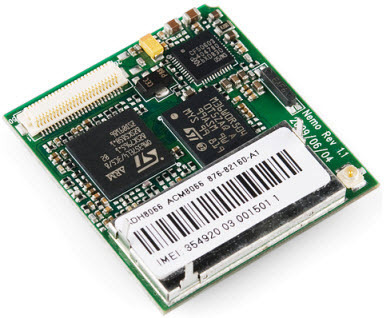 It consists of resistors and transistors integrated on a chip. The colored boxes represents: outlined blue-differential amplifier, outlined magenta-voltage amplifier, (outlined cyan-output stage, and outlined green-voltage level shifter) outlined cyan and green-output amplifier, outlined red-current mirror. There are different examples for analog integrated circuit designs such as power management circuits, operational amplifiers, and sensors that are used with continuous signals for performing the functions such as active filtering, power distributing for components with in chip, mixing, and so on. Analog integrated circuit design is used for active filtering. Active filter or analog electronic filter utilizes active electronics components like amplifiers used for improving performance and predictability of a filter by avoiding the bulky and expensive inductor. There are different configurations of active filter (electronic filter topology) that includes sallen-key filter, state variable filters, multiple feedback filters and so on. In analog integrated circuit design (or any integrated circuits), all the electrical and electronics components that are used and integrated to design the integrated circuit requires power. This required electrical power is distributed to the on chip components using a network of conductors designed on chip. Power management circuit includes analysis and design of these types of networks (network of conductors) that are used for distributing power within the circuit. The frequency mixer also called as mixer (nonlinear electrical circuit) is an analog integrated circuit design that is used for frequency mixing. Frequency mixing can be defined as creating a new frequency from two different signals applied to the circuit. These are also used for shifting signals form one range of frequency to other. Operational amplifier shown in the above figure is the best fundamental module in analog integrated circuit design. There are different types of operational amplifiers but IC 741 Op-Amp is most frequently used operational amplifier in many applications. The simple input/output (I/O) relation of op-amp is the reason behind using op-amp in analog integrated circuits design. 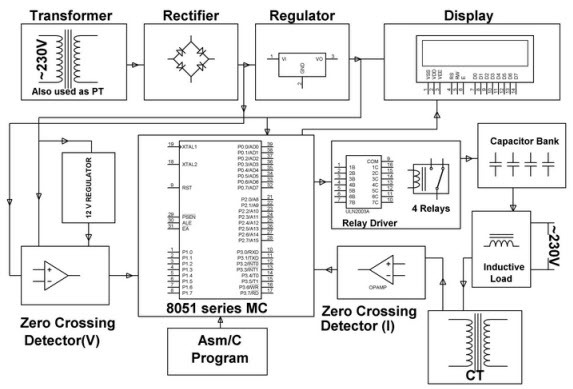 Power saver for industries and commercial establishments’ project is an application of one of the analog integrated circuit designs, namely IC 741 op-amp. To reduce the power loss in industries shunt capacitors are used for providing power factor compensation. Power factor can be defined as the ratio of real power or active to apparent power or sum of active and reactive power. As the power factor decreases, more energy is required to meet the load demand. Thus efficiency will decrease and cost (power bill) will increase. In this system, the zero voltage pulse and zero current pulse have time lag between them which is suitably generated by operational amplifier circuits in comparator mode. These are fed to the two interrupt pins of the 8051 microcontroller that displays the power loss due to inductive load on LCD. The voltage at potential transformer is fed to the operational amplifier acting as zero crossing detector V, and current at current transformer is fed to the operational amplifier acting as zero crossing detector I. 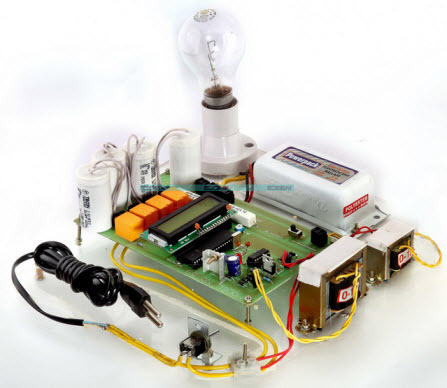 The outputs of these operational amplifiers is given to the 8051 microcontroller which controls the actuation of relays through relay driver IC for connecting shunt capacitors in the circuit to make zero power loss. Do you know applications of analog integrated circuits? Feel free to share your technical knowledge and doubts regarding the electrical and electronics projects by posting your comments in the comment section below. Please check the user-friendly website https://www.elprocus.com for complete details in the kit content section and go through the FAQ for details.